The large reductions in October styrene contracts were followed by another round of notable price decreases in the downstream PS market in Europe. Players report three digit decreases on transactions this week as the recent falls attracted some buyers to the market to make needs-based purchases, according to ChemOrbis. October PS prices came with €130-140/ton decreases in Italy this week, while more significant reductions of up to €170/ton were seen in a few cases. 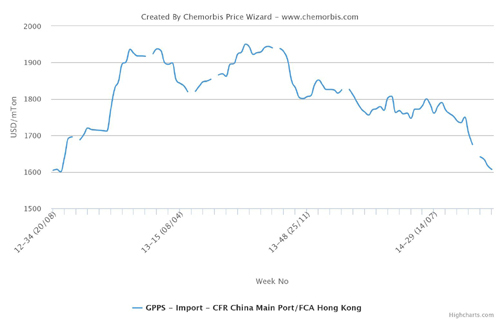 Considering that styrene contracts settled with reductions of €210/ton, converters are still cautious about making new purchases at this time. They are not interested in building stocks either as they keep an eye on the upstream chain to see whether there is further room for the PS market to go down or not. Players concur that supply has improved but remains limited despite a recent restart at a Central European producer. “The producer has resumed deliveries and we purchased some GPPS. However, we learned that they were sold out already for this month and closed their sales later this week,” confirmed a converter. In Germany, a distributor offers €140-170/ton discounts saying, “PS prices are likely to see €200/ton drops in some cases. Demand is performing better as sharp decreases attracted some buying interest.” A disposables manufacturer in Belgium claimed to have obtained €170/ton decreases compared to his last purchase from a West European supplier. “We purchased a good quantity and our source had not granted us the entire monomer drop in September,” he explained.